comment Experience Amazing Again and Again with this flexible open-dated 2 day ticket! 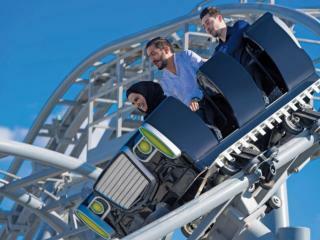 The Dubai Parks And Resorts 2 Days All Parks Ticket gives you flexibility to explore all four world-class theme parks featuring over 100 rides, shows and attractions at your own pace. Experience 2 days of unlimited access to MOTIONGATE™ Dubai, Bollywood Parks™ Dubai, LEGOLAND® Dubai and LEGOLAND® Water Park. Your flexible open-dated ticket can be activated at any time within 6 months of purchase and offers 2 days admission within a 7 day window from first use. Embark on a Hollywood-inspired adventure that will take you beyond the screen at MOTIONGATE™ Dubai™. Step into the magical, mythical worlds of some of cinema’s most beloved movies and explore three legendary film studios in one theme park – Sony Pictures Studios, DreamWorks Animation and Lionsgate. Get ready to be transported into the world of movies such as Shrek, Kung Fu Panda, Hotel Transylvania, Ghostbusters, The Smurfs and The Hunger Games. How about a perfect day for the whole family? The well-known LEGO® brick comes to life in a unique interactive world of LEGO themed rides, shows and attractions specifically designed for children aged 2-12 and their families. At LEGOLAND® Dubai, children can stretch their imaginations to become the ‘heroes’ in a fun day for the entire family. Featuring over 40 interactive rides, shows and attractions and 15,000 LEGO model structures made from over 60 million LEGO® bricks, you will find six themed lands, each unique in their experience, entertainment and educational offering. The Dubai Parks And Resorts 2 Days All Parks Ticket is open-dated and MUST be used within six months from purchase date. You will receive a gate-ready Dubai Parks And Resorts 2 Days All Parks E-ticket that must be printed on receipt. Upon arrival, simply scan the barcode at the gate for admission to the parks. This ticket gives you admission to all four parks at Dubai Parks & Resorts - MOTIONGATE™ Dubai, Bollywood Parks™ Dubai, LEGOLAND® Dubai and LEGOLAND® Water Park - for the duration of the ticket. Tickets are valid for 2 days admission within a 7 day window from first use. Tickets do not need to be used over consecutive days. All guests entering Dubai Parks and Resorts are subject to the rules and regulations of entry as displayed at the main entrance and within Guest Services. Can I visit all of the Dubai Parks and Resorts attractions in 2 days? Yes, your ticket gives you unlimited admission to MOTIONGATE™ Dubai, Bollywood Parks™ Dubai, LEGOLAND® Dubai and LEGOLAND® Water Park. Children under the age of 3 can enter the parks for free. Children under the age of 12 must be accompanied by an individual aged 18 years or over. Children under the age of 3 visiting LEGOLAND® Water Park must pay a minimal fee, which includes swimming diapers. This is paid locally.